I recently was informed that I had won a very distinguished honor. A copy of the letter I received is attached to this blog below and can be clicked to magnify it. Here is a transcript of the letter. Needless to say, I was blown away by the gesture that the N.A.P.W. 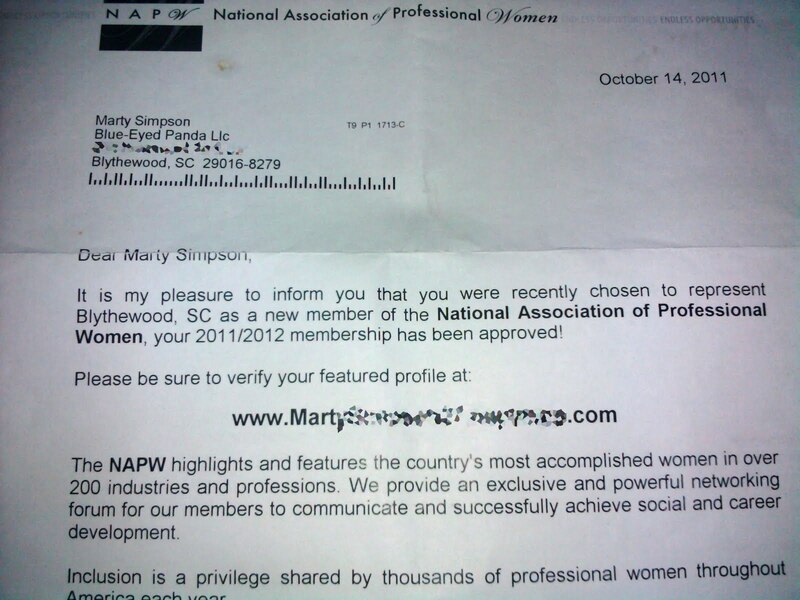 made by selecting me to represent Blythewood, South Carolina in their organization. 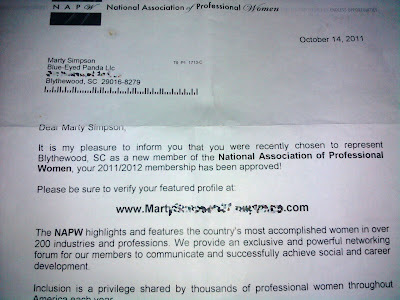 It is my pleasure to inform you that you were recently chosen to represent Blythewood, SC as a new member of the of the National Association of Professional Women, your 2011/2012 membership has been approved! Yes, you read that correctly! It goes on. When I clicked the link I was given the opportunity to pay 197 dollars for the "privilege" of joining. Oh but wait, it goes on. The NAPW highlights and features the country's most accomplished women in over 200 industries and professions. [ and evidently a few select men! ] We provide an exclusive and powerful networking forum for our members to communicate and successfully achieve social and career development. Inclusion is a privilege shared by thousands of professional women throughout America each year. AND BY ME! I am so touched! Click the picture below to see a larger, readable version of their letter to me.